The New Year always brings about new trends and this is no different when it comes to jewellery. The season is going to offer plenty of excitement for all the jewellery fans out there, from statement pieces to classic elegance that will surely bring a smile on your face. If you want to update your jewellery collection this year, then pick your favourites from the below selection of trendy and affordable items that include art-themed earrings, cross necklaces, arm cuffs among many others. Statement earrings are a big hit in 2017. The grandiose the better is the best way to describe the season’s designs. Furthermore, the trend is to opt for something bold and art-like. Your earrings should almost be taken directly from the latest graduation party of an art school, with futuristic lines and graphic shapes. If you’re not afraid to impress, think in terms of Proenza Schouler’s Calder-style earrings. You should also be playful with the earring materials. Feathers, plastic and even different combinations of metals are a big hit this season. For a bold, yet an affordable option, consider ‘Santeria’ from the Valentino collection, available at Lane Crawford. Aside from statement earrings, the season will also feature a single, oversized earring. The trend is especially popular with a golden finish or a unique use of fabric, such as a feather. You don’t have to worry about finding single earrings, as you can just pick statement earrings from Michael Hill and use only one of them when dressing up. Depending on your dress, you can even keep switching sides to ensure you don’t just end up using one of the earrings. If you are looking for a new ring this season, vintage is the style to go with. Different era styles will be popular, with animal designs and large, narrow stones are another big design choice to go with. In terms of colour, the classic jade green and navy blue are great options for your vintage ring – something like the Siren Ring from Monica Vinader would definitely add the right razzmatazz to your look. Another bold jewellery piece for the season is the arm cuff. 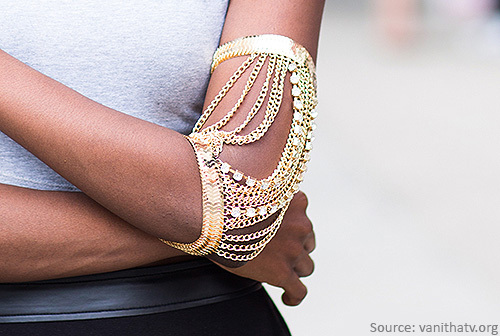 The arm cuff, adding a great layer to your clothing, replaces bracelets. You should think in bold terms and opt for layered arm cuffs in unique, graphic shapes. Gold is definitely the metal for arm cuffs in 2017 and you can find sensual cuffs from Cbazaar’s jewellery collections. When it comes to jewellery materials, the season is for uncut minerals. Raw stones and mineral slices add an edge to your look and bring jewellery back to basics. Jewellery is not considered just an accessory and a stand-alone item, but part of the clothing. Stella McCartney used plenty of energising stones and crystals as part of her catwalk and her jewellery is worth looking into at ShopStyle. You should also consider doing jewellery shopping at the more unusual places such as BlueGems for a great mineral inspired look. Statement necklaces have been a big thing in the past few seasons, and 2017 won’t be any different. But the show-stoppers will change from the choker model to the sautoir or the long necklace. The statement necklace of the season is a massive, low hanging piece with special ethnic or old-fashioned design. Prada used Art Deco inspired designs in their runway shows, while Chanel trusted elegant pearls. We love the selection available at Colette by Colette Hayman, with its colourful and more toned-down statement necklaces. The necklace trend is definitely a great way to add a bit more glamour to your business or party look. Lighters, bicycle chains and ropes might not sound like popular jewellery pieces, but in 2017 the eclectic objects become jewellery. Runways for the spring have featured all sorts of everyday objects as jewellery and the results have actually looked rather lovely. We love the quirky collections at Forzieri, which provide plenty of unexpected glamour to jewellery selection. Another unexpected option is to big a wooden watch from WeWood. You could naturally even use sites like Feeling Inspired to start crafting your own jewellery with the help of unwanted items – those empty lighters might finally find a new home. Another big hit in terms of necklaces this season is the crucifix or the cross. Dolce & Gabbana and Fausto Puglisi all used crosses in different ways as part of their runway shows. The gold cross is classic and the style also works well in bracelets and earrings. The key is to ensure you opt for something bold – like the Dainty Cross Pendant from JollyChic. So, there you have a selection of the best jewellery trends for this season. There’s plenty of excitement and grace in the season’s designs and with the above ideas, you will hopefully be able to pick out something to stay glamorous during the winter season.